These stations are part of Corridor-III (Ameerpet to Hitec City stretch) of the Hyderabad Metro Rail Project. 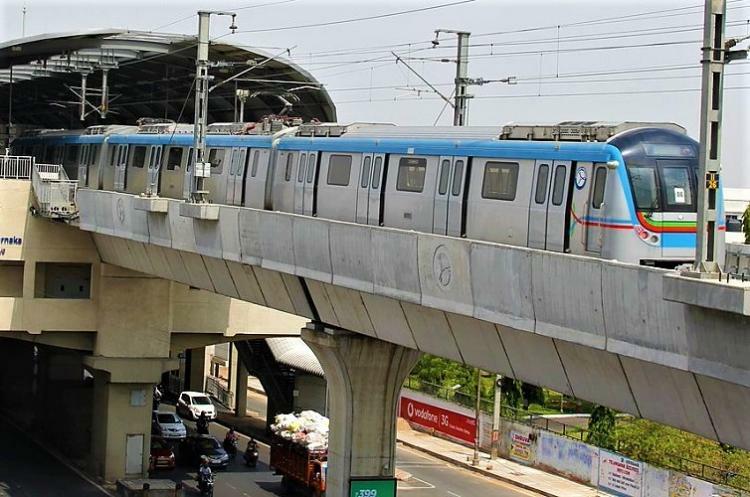 Hyderabad: On 27th September Thursday L& T Metro Rail (Hyderabad) announced that the Chief Electrical Inspector to Government of India (CEIG) for Hyderabad Metro Rail Project D.V.S. Raju has inspected 33kV/415V indoor substations installed in four stations from Peddamma Temple to Hitech City. These stations are part of Corridor-III (Ameerpet to Hitec City stretch) of the Hyderabad Metro Rail Project. This inspection is a kind of formality to process according sanction for energisation of stations which will facilitate the testing and commissioning activities of railway systems like signalling, telecommunication and automatic fare collection in this section. CEIG D.V.S. Raju observed that the Metro rail stations receive power at 33kV voltage through ring main fed from 132/33/25 kV receiving sub-stations (RSS) located at Yousufguda and Uppal. Commissioning these auxiliary sub-stations will boost the progress and hasten the completion of metro rail section between Ameerpet and Hitec City of Corridor-III. L&T Metro Rail MD & CEO K.V.B. Reddy said that a month ago, Mr. Raju had inspected the indoor substations in four other metro rail stations from Madhuranagar, Yousufguda, Jubilee Hills Road No 5 and Jubilee Hills Check Post on the same route. This is an important development for Corridor-III (Ameerpet to Hitec City stretch) as commissioning these stations will make auxiliary power supply available for the entire stretch of 10 km. HMR MD N.V.S. Reddy also said that in just two days of being brought under the metro rail network, the terminal station of L.B. Nagar has overtaken all other stations in having 10,200 passenger footfalls like Miyapur 8,800 and KPHB 8,600. Ameerpet interchange station continues to be in the top clocking 14,700 passengers a day, informed. He also added that 1.66 lakh passengers had travelled on Wednesday out of whom 1.50 lakh were paid passengers. The new section of Ameerpet- LB Nagar has added 82,000 and hence, the number of passengers using Corridor 1 – L.B. Nagar to Miyapur of 29 km was at 1.16 lakh. The 17-km stretch of Corridor III (Ameerpet-Nagole) accounted for 50,000 footfalls.